Southern Star: would you tolerate an abusive parrot? Last week's Southern Star column on CBT for low self-esteem is pasted below. 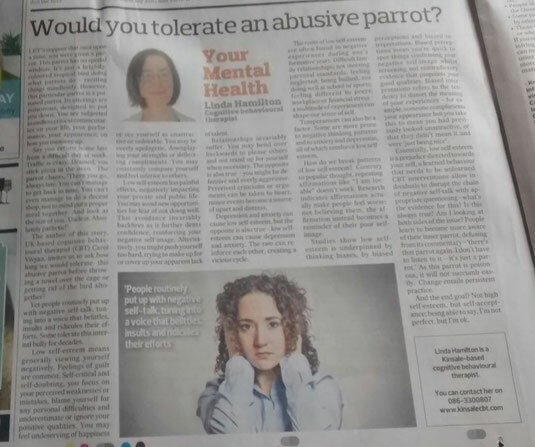 The column can also be read on the Star's website at http://www.southernstar.ie/life/roundup/articles/2017/03/08/4136075-would-you-tolerate-an-abusive-parrot/. Let’s suppose that once upon a time, you were given a parrot. This parrot has no special wisdom. It’s just a brightly-coloured tropical bird doing what parrots do – reciting things mindlessly. However, this particular parrot is a poisoned parrot. Its utterings are poisonous, designed to put you down. You are subjected to endless critical commentaries on your life, your performance, your appearance, on how you measure up (continued below). The author of this story, UK-based cognitive behavioural therapist (CBT) Carol Vivyan, invites us to ask how long we tolerate this abusive parrot before throwing a towel over the cage or getting rid of the bird altogether? Yet people routinely put up with negative self-talk, tuning into a voice that belittles, insults and ridicules their efforts. Some tolerate this internal bully for decades. Low self-esteem means generally viewing yourself negatively. Feelings of guilt are common. Self-critical and self-doubting, you focus on your perceived weaknesses or mistakes, blame yourself for any personal difficulties and underestimate or ignore your positive qualities. You may feel undeserving of happiness or see yourself as unattractive or unlovable. You may be overly apologetic, downplaying your strengths or deflecting compliments. You may constantly compare yourself and feel inferior to others. Low self-esteem has painful effects, negatively impacting your private and public life. You may avoid new opportunities for fear of not doing well. This avoidance invariably backfires as it further dents confidence, reinforcing your negative self-image. Alternatively, you might push yourself too hard, trying to make up for or cover up your apparent lack of talent. Relationships invariably suffer. You may be bend over backwards to please others and not stand up for yourself when necessary. The opposite is also true – you might be defensive and overly aggressive. Perceived criticisms or arguments can be taken to heart; minor events become a source of upset and distress. Depression and anxiety can cause low self-esteem, but the opposite is also true – low self-esteem can cause depression and anxiety. The two can reinforce each other, creating a vicious cycle. The roots of low self-esteem are often found in negative experiences during one’s formative years. Difficult family relationships; not meeting parental standards; feeling neglected; being bullied; not doing well at school or sports; feeling different to peers; workplace or financial stress – a multitude of experiences can shape our sense of self. Temperament can also be a factor. Some are more prone to negative thinking patterns and to anxiety and depression, all of which reinforce low self-esteem. How do we break patterns of low self-esteem? Contrary to popular thought, repeating affirmations like “I am lovable” doesn’t work. Research indicates affirmations actually make people feel worse; not believing them, the affirmation instead becomes a reminder of their poor self-image. Studies show low self-esteem is underpinned by thinking biases, by biased perceptions and biased interpretations. Biased perceptions mean you’re quick to spot things confirming your negative self-image whilst screening out contradictory evidence that pinpoints your good qualities. Biased interpretations refers to the tendency to distort the meaning of your experiences – for example, someone compliments your appearance but you take this to mean you had previously looked unattractive, or that they didn’t mean it and were “just being nice”. Essentially, low self-esteem is a prejudice directed towards your self, a learned behaviour that needs to be unlearned. CBT interventions allow individuals to disrupt the chain of negative self-talk with appropriate questioning – what’s the evidence for this? Is this always true? Am I looking at both sides of the issue? People learn to become more aware of their inner parrot, defusing from its commentary – “there’s that parrot again. I don’t have to listen to it – it’s just a parrot”. As this parrot is poisonous, it will not succumb easily. Change entails persistent practice. And the end goal? Not high self-esteem, but self-acceptance; being able to say, I’m not perfect, but I’m OK.